This is a very provocative article about protesting and what it accomplishes. Read it. Fairly short. Most US leftists make sign-waving demonstrations a core tactic. They shouldn't. Protests create the feeling of power, but not the reality. In high school, I went to my first protest. Someone passed me a sign – "ABOLISH THE DEATH PENALTY" – as we marched to the governor's mansion. The organizers read our demand: that the governor commute the sentence of a Death Row prisoner nearing his execution date. After twenty minutes of chanting slogans, we withdrew to the courtyard in front of City Hall, where a folk-punk singer performed and activist groups tabled. The governor didn't listen. He didn't even hear us, strictly speaking – after a fire a few weeks earlier, the governor's mansion was closed for repairs. He wasn't physically there. Conspiracy theories notwithstanding, on November 4th, "it" did not begin. Refuse Fascism, a front group for a strange political sect called the Revolutionary Communist Party, spent months calling for "thousands becoming hundreds of thousands, and then millions" of protesters to "drive out the Trump/Pence regime" (an echo of its old "drive out the Bush regime" slogan). Although Refuse Fascism couldn't deliver, anti-Trump protests have happened on that scale: April's March for Science turned out more than a million, and nearly five times that many joined the Women's March in January. However, millions in the street didn't bring the Trump Administration down. And while he's had a hard time enacting his program, that's not because of liberal or leftist opposition – his biggest obstacle has been the ongoing faction fight in his own party. So even if "it" had begun, why would Refuse Fascism's protests have worked any better than their precursors? The US government does not cease to function simply because people oppose it. Sure, the plan's political incoherence didn't help (were Trump and Pence supposed to resign in succession? Was the goal to install President Paul Ryan?). But goals aside, Refuse Fascism never explained how, exactly, demonstrations were going to bring Trump down. Signs with slogans do not possess that kind of power, even if there are millions of them. Most anti-Trump protesters, though, likely don't share Refuse Fascism's belief that their activities will literally end Trump's presidency before he finishes his term. If they did, November 4th would probably have been much less anticlimactic. Rather, they're less ambitious: they want to express disapproval of the Trump Administration, to make their voices heard. That's what we were after in front of the governor's mansion. We knew he wasn't going to commute anyone's sentence. We protested because the death penalty was wrong, not because we expected to win. But is the Left served by self-expression for its own sake? It exists to help the working class, rather than the ruling class, exercise political power. Most US leftists make sign-waving demonstrations a core tactic. They shouldn't. Protests create the feeling of power, but not the reality. Shouldn't revolutionaries instead dedicate their limited resources to institution-building, which does tangibly increase working-class power? Orienting towards the protest scene keeps radicals safely within liberalism's orbit. After all, the activist subculture is dominated by the Democratic Party and its extensive network of front groups. Why did November 4th fail? It hinged on the subculture's support. But Democrats have that base, so Democrats set its agenda. The Futility of "Expressive Protests"
To be clear, "protest" is an imprecise term. It elides activities that shouldn't necessarily be equated. So, this critique doesn't extend to concrete confrontation: that is, physically preventing something from happening. Striking workers holding a picket line and people at Standing Rock blocking the pipeline differ from most protests – they involve literally stopping the things they oppose. Rather, this criticism targets expressive protests: demonstrations that demand something, but don't do it. That includes not just permitted marches with police escorts, but also many ostensibly militant activities. Blocking streets for gay marriage, marching through city centers against trade agreements, and getting arrested in "direct actions" against policies being carried out thousands of miles away all fall within the spectrum of expressive protest. It resembles concrete confrontation in form, but they're like red wine and grape soda. The superficial similarity hides a qualitative difference. Expressive protest means actions like those of February 2003. Millions of people around the world turned out against George Bush's immanent invasion of Iraq, forming "the largest protest event in human history." The New York Times was impressed enough to write that "there may still be two superpowers on the planet: the United States and world public opinion." Bush, however, simply ignored the demonstrations and proceeded to launch the war. The "second superpower," it turned out, couldn't compete with state power. Expressive protest is ubiquitous and meaningless. A protest might be numerically "successful," but by its nature, it doesn't change any aspect of collective life. That's why liberals love it. Because the 2000s anti-war movement structured itself around a powerless tactic, what option did it have besides falling into place behind John Kerry's pro-war presidential run? Since it couldn't escape the Democratic Party's hegemony, is it any surprise that it dissipated under Obama, even though he escalated Bush's wars? Expressive protests don't lead to actual power. What option did the anti-war movement have besides narrow electoral opposition to Bush, the individual politician, on the Democratic Party's terms? The Limitations of "Mass Upsurges"
Isn't this argument one-sided, though? Sure, a peace vigil in front of a state capitol isn't going to influence foreign policy. But aren't some protests more effective than that? Periodically, millions of people more-or-less spontaneously join a protest movement, forming a mass upsurge. When that many people are developing political consciousness and acting on it, often for the first time, it can't be dismissed. Aren't institution-building and participating in mass upsurges complementary, not opposed? They aren't premeditated. The feminist writer Jo Freeman describes two ingredients for protest movements: a pre-existing communications network through which the movement's ideas can spread, and a crisis to act as the "spark." She gives the example of 1960s radical feminism: women participants in the New Left formed a communications network, and a series of public displays of misogyny from male leaders served as the galvanizing crisis. While Freeman emphasizes the role of organizers in developing networks, "sparks" are inherently unpredictable. 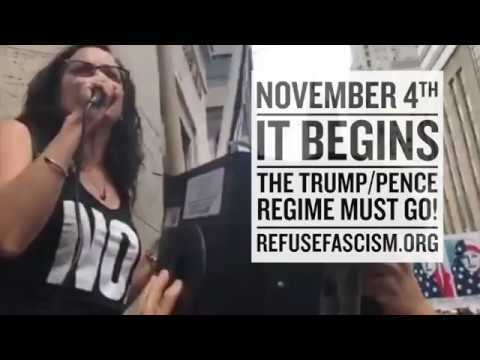 Attempting to simply will one into being virtually always fails, as Refuse Fascism discovered on November 4th. Their participants consistently conclude that protest doesn't get the goods. Occupy's encampments lasted for weeks, occasionally months. However, even the longest-lived encampments found themselves unable to win any of their goals. The financial system wasn't slowed; it simply ignored the people in Zuccotti Park, just like George Bush had ignored the anti-war movement. Unfortunately, the Occupiers saw no practical alternative to the protest cycle. So, some joined the activist-networking scene, but most dropped out of politics entirely. Their expressive protests were massive, disruptive, and sustained. They still failed. So, for radicals, the question of protest attendance during an upsurge is less important than it looks. The most helpful kind of engagement isn't protesting louder, more often, and with more radical slogans. It's offering the kind of alternative that the activist subculture won't. Most radicals, though, couldn't provide anything better than sign-waving. That approach enjoys hegemony within the activist subculture for a reason: the Democratic Party and its front groups dominate the scene, and as the anti-war movement showed, it's uniquely suited to their aims. They want to be benevolent technocrats with a passive base of support. Of course Democrats promote powerless tactics. They oppose mass participation in the exercise of power. But don't protests sometimes actually work? For instance, counter-demonstrations against alt-right events materially interfere with their movement by hindering their ability to recruit. Besides, no tactic is useful for everything. Doesn't protest still have a place in the activist's toolkit? Well, in that example, there's a specific goal that the protest tactic addresses: to demoralize fascists in order to slow their recruitment, facing them with large numbers of people is effective. But how often is the target of an expressive protest not only physically present, but also doing something that gets disrupted by the mere proximity of protesters? For movements on the fringe of public acceptability, losing a community's goodwill means losing the ability to replenish its membership. Protesting works against fascist events because they're uniquely susceptible to social stigma – but what about governments and corporations? Bad PR may irritate them, but it doesn't stop them from doing what they want. Protesting is like a mountain climber's axe. Under very specific circumstances, it's the right tool. Otherwise, it might look impressive, but you can't build anything with it. All else being equal, it's probably better to have it in your toolkit than not. But for most jobs, it simply won't work. When liberals insist that the point of protest is to "have your voice be heard," they are actually describing the fascist mode of political participation. To be satisfied with "feeling heard" in and of itself, as the goal of political activity, without pointing that expression toward building real material power, is to be a contented fascist subject. It's not the expression of ideas. That's the fascist bait-and-switch: promising the reality of power, but only delivering the feeling of it, the catharsis of "making your voice heard" and "finally being listened to" by a leader. But liberalism operates no differently, pushing expressive protest as a stand-in for the actual power it restricts to business leaders and state officials. That's politics, properly defined – collectively exercising real social power. Revolutionary institution-building is politics; each institution is an instrument through which a working-class community can shape some part of its shared life. Expressive protest is not. Emotionally, it resembles the feeling of politics, but the substance isn't there. It's closer to a letter to the editor, asserting a belief without enacting it. Even if it's impressive enough to make the front page, it doesn't build mass power. That's what the Democratic Party prefers. If the Left wants something better, how much longer can it afford to squander itself on expressive protests?